Leon Clarke heads home the third. Chris Wilder's side proved too hot to handle on a chilly night in East Staffordshire where even a stunning 25-yard effort from Matty Palmer to level things up for Albion could not prevent the Blades enhancing their promotion credentials. United skipper Sharp lived up to his name, darting into the box in the ninth minute to try and latch onto a through ball from John Fleck. He was eased off the ball by former Bramall Lane academy product Kyle McFadzean, too forcefully in the opinion of referee Oliver Langford, and the United striker stepped up to comprehensively find the top corner from 12 yards. United's high energy game was forcing Burton back and into mistakes on the ball which Wilder's men were quick to seize upon. Former Albion man Mark Duffy was denied a goal on his return to the Pirelli Stadium by an excellent block from Albion skipper Jake Buxton. 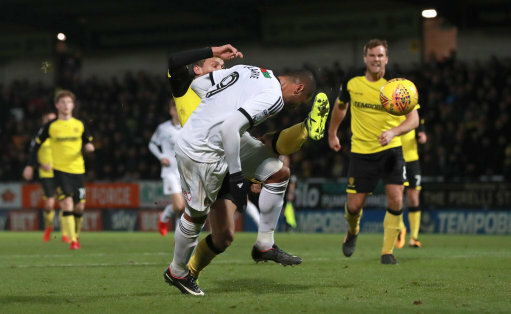 Burton's equaliser, when it came just after the half-hour mark, was slightly against the run of play, with Palmer on hand to provide an outlet for Marvin Sordell and his left-footed effort flying past Jamal Blackman who was left grabbing at thin air. Parity was only restored for a matter of three minutes though as another rapier-like move cut Albion's defence open once again to allow Sharp to coolly fire home hard and low. Clarke fired against a post and Duffy sent a rising drive just over as United looked to stretch their lead even further. But the first half ended on something of a sour note for the visitors with midfielder Paul Coutts leaving the pitch on a stretcher after a nasty collision in the box. Albion looked more purposeful after the break as they tried to avoid a fifth successive home defeat but they were struggling to find clear-cut opportunities to beat Blackman for a second time. Northern Ireland midfielder Matty Lund went close with a low drive that was blocked by a white shirt with the Chelsea loanee struggling to make his ground. United always looked a threat even though their attacks had become slightly less frequent and they were ruthless on 78 minutes as they put clear daylight between the two sides. Fleck was again the provider with a ball into the box that Clarke stooped to head past Bywater. Substitute David Brooks almost added a fourth moments later with a burst through the middle before drilling just wide of the upright. But there was no doubt by that stage that the points would be heading back up the M1 to South Yorkshire. Burton Albion: Bywater, Warnock (Miller 81), Allen (Scannell 65), McFadzean, Turner, Murphy, Lund, Dyer (Akins 26), Sordell, Palmer, Buxton. Unused: Ripley, Flanagan, Naylor, Varney. Sheffield United: Blackman, Stevens, Fleck, O'Connell, Basham, Clarke, Sharp (Brooks 70) Wright, Coutts (Lundstram 45), Carter-Vickers, Duffy (Carruthers 88). Unused: Moore, Donaldson, Stearman, Lafferty.